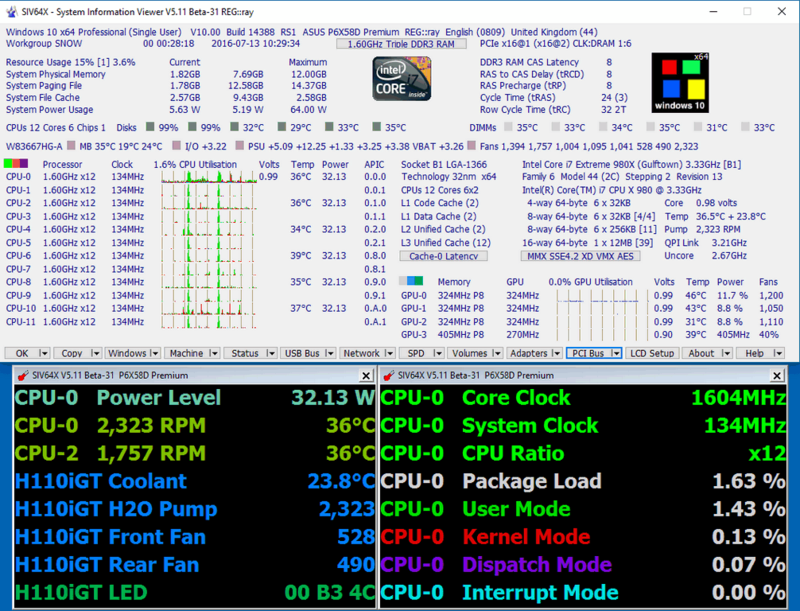 SIV (System Information Viewer) displays lots of core operating system, network and hardware-related information including CPU, PCI, PCMCIA, USB, sensors etc. The program varies from other system monitors in its "dashboard"-style view: a thin bar of key system information that can be expanded upon. Stealth: ? No. Writes some non user-configurable values to the registry. Thanks Wolfghost and red-ray: added the nosivreg bit to the entry. If this writes a "bunch" of stuff to the registry it can hardly be called portable? I just ran it on XP and Win 8. No BSODs or any problems what so ever. Very good app. Provides extremely detailed information, more than I've seen on most other system info apps. If running SIV causes a BSOD then send the dump file which is in C:\Windows\Minidump\ to the author so he can try and fix it. The screenshot should be updated. It's over 5 years old and the current release looks rather different. Best avoided in my experience. Any attempt to run SIV32X.exe results in a BSOD on my Win7HP 32-bit desktop. I changed the download link. Now it links to the main page, where you can choose your download. I got the same error but was able to download the file by simply reloading the page. I think it may be returning the error because of the HTTP referrer (portablefreeware.com in this case). Addition: SIV, unfortunately, installs a driver in \Windows\System32\Drivers and makes appropriate changes in the registry. The system is not restored after SIV termination, which defeats the idea of portability. Ugly? Yes. But very useful and displays a lot of info for free. It's ugliness is only of a secondary or perhaphs tertiary importance. This is one ugly piece of software.. Stick with SIW. This app is CRAP! I launched it and my system froze. After 10 minutes, I had to use the power button to reboot. I'll stick with SIW ( System Information for Windows). It's a stand alone .exe, runs fine from my usb drive, and has a lot of cool extra tools. I have the Taskbar on top creen not bottom screen like defalt Window XP screen. The window bar of SIV application will hide under Window XP Taskbar. I must unlock the Window XP Taskbar to move SIV window. Why the position of SIV window not open by center screen? For a piece of software whose only task is *displaying* information, it is unbelievably ugly. SIW seems to be better in every respect. Sure, it doesn't display as much information at the same time, but that probably is what makes it easier to use. @Loner: SIV offers a -SAVE command line option to save all findings or selected ones into a file. That's how I use it.